A Japanese robotics firm is making a robotic suit called HAL available to rent. 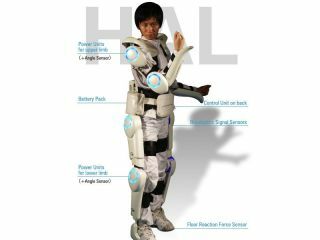 The HAL suit – which stands for 'hybrid assistive limb' - reads those brain signals that activate the limbs and can be used to assist disabled and elderly people with mobility problems. HAL will be available in small, medium and large – effectively a fully cybernetic suit straight off the peg! Japanese robotics specialist and manufacturer Cyberdyne plans to mass produce the HAL suits, which are made up of a waist-attached 22lb battery-powered computer that operates mechanical braces strapped to the user's arms and legs. "We are ready to present this to the world," said Yoshiyuki Sankai, HAL's designer and Cyberdyne's Chief Executive. "Hal can only lead to extending the abilities of the elderly and keep them out of care for longer," said the University of Sheffield's well-known robotics expert, Noel Sharkey. You can see the demo video over on Cyberdyne's website.